Fundamental biological processes that involve the conversion of energy into forms that are usable for chemical transformations are quantum mechanical in its nature. These processes involve chemical reactions themselves, light absorption, formation of excited electronic states, transfer of excitation energy, transfer of electrons and protons, etc. Some other biological processes, e.g. orientation of birds in the magnetic field of Earth, have been also suggested to require quantum mechanics. The figure presents the scheme of the integral membrane proteins forming the photosynthetic unit. 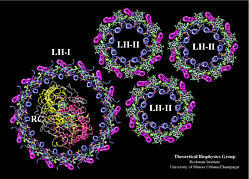 Light-absorption and excitation transfer within the light-harvesting proteins (LH-II and LH-I) are represented by wavy lines. Electron transfer within the photosynthetic reaction center (RC), cytochrome c2, and bc1 complex is represented by blue lines. 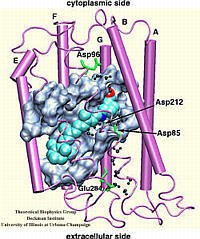 Proton transfer in the bc1 complex and the ATPase is represented by red lines. The chemical reaction of ATP synthesis is represented by a black line. The description of quantum processes in biological systems is usually focused on specialized molecules, e.g., chlorophylls, which are embedded in larger protein environment. The extremely challenging task of describing the dynamics of such systems, involves several open problems on which the Theoretical Biophysics Group is working on: quantum mechanical description of large molecules (computational demand for quantum description increases exponentially with the number of particles), combined quantum/classical description (to treat molecules which behave quantum-mechanically within the context of its classical/protein environment), stochastic quantum mechanics combined with molecular dynamics. 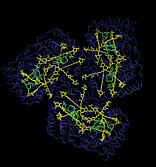 Light harvesting complexes provide fascinating challenges to biophysicists. With the availability of atomic structures for protein-pigment complexes such as photosystem I, it is possible to form a comprehensive picture of the light absorption and excitation migration processes based on an atomic level quantum mechanical description. This kind of structural analysis not only forms a rigorous test for our understanding of the physics of these mechanisms through a comparison to spectroscopy and kinetics experiments, but it also provides a framework within which the organizational principles for multi-component pigment-protein assemblies can be investigated. Figure produced with VMD . The photosynthetic unit of purple bacteria consists of the photosynthetic reaction center, surrounded by light-harvesting complexes. The initial step of photosynthesis, i.e., light-absorption by chlorophylls and carotenoids in light-harvesting complexes and transfer of excitation energy to the photosynthetic reaction center are studied by quantum chemistry and effective Hamiltonian methods. In light-harvesting complexes, carotenoids act as light-absorbers in the blue-green region of the spectrum. Absorption of a photon is followed by rapid singlet excitation energy transfer to bacteriochlorophyll (BChl). In addition to their light-harvesting role, carotenoids photoprotect antenna complexes, i.e., they prevent the formation of photo-oxidizing singlet oxygen by quenching BChl triplet states through triplet excitation transfer. Light-harvesting and photoprotection by carotenoids is studied in Theoretical Biophysics Group in two proteins, the Light-Harvesting Complex II of Purple Bacteria, and the Peridinin-Chlorophyll-Protein of Dinoflagellates. The all-trans retinal protonated Schiff base (RSPB) is the chromophore of bacteriorhodopsin (bR), a transmembrane protein that acts as a light-driven proton pump in Halobacterium salinarium, converting light energy to a proton gradient. Upon absorption of light the chromophore undergoes a photoisomerization process (all-trans -> 13-cis) that eventually provides the driving force for the translocation of protons. This elementary photoisomerization process proceeds on multiple coupled potential energy surfaces and we have modeled it using a formally exact quantum-mechanical procedure: the full multiple spawning method. Currently, we are studying the first excited electronic state of the chromophore using an isolated retinal analog model and ab initio CASSCF methods. The characterization of the first excited state (minima and conical intersections associated with isomerization around different double bonds) will enable us to extend and improve the aforementioned quantum-mechanical studies of the photoreaction dynamics in the protein. We study the suggestion that the geomagnetic field is detected by changes in the rates and yields of radical pair reactions. Assuming that photoreceptors involved in vision are involved in radical pair reactions, the magnetic field will result in a modulation of vision. The visual modulation patterns furnish animals with magnetic compass capabilities as illustrated in the figure. Contact Us // Material on this page is copyrighted; contact Webmaster for more information. // Document last modified on 06 Jul 2011 // .